Home Motorcycle Motorcycle throttle locks: Cruise control! A motorcycle cruise control setup can provide wrist relief when riding down the freeway. But if your bike is like mine and did not come with an electronic cruise control, an option is a motorcycle throttle lock. A throttle lock locks the throttle when cruising at highway speeds. Go to Amazon to read customer reviews of good motorcycle throttle locks in 2019 or continue reading below for mine. I looked at the Kaoko throttle lock, which looks nice and almost like a stock piece, but could not justify the $100+ price. Instead, I bought a Go Cruise 2 universal motorcycle throttle control, which locks the throttle in a specific position to maintain the desired speed. I, also, bought a Crampbuster CB2 Wide, which is a throttle assist. I compare and review both in this article. 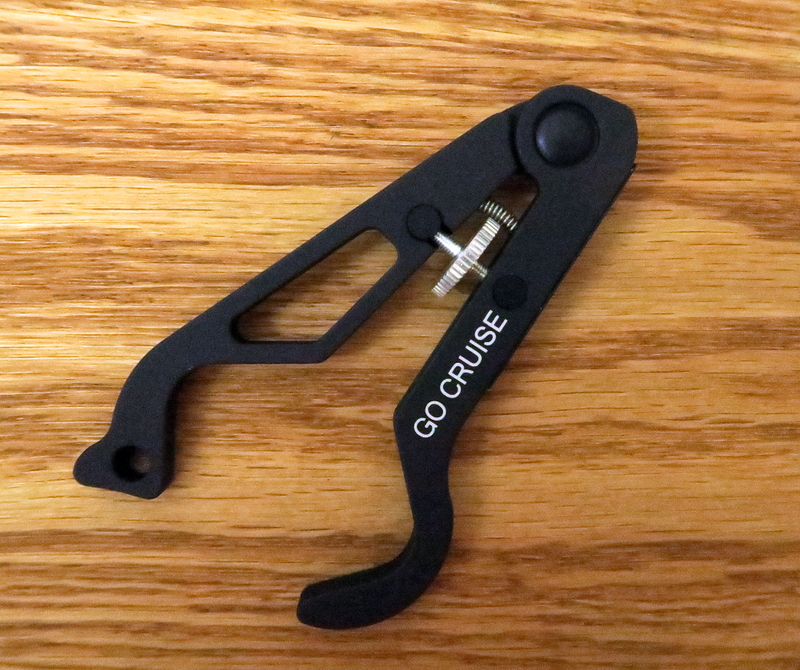 The Go Cruise throttle lock provides relief from squeezing the throttle grip the entire ride. The Go Cruise 2 is adjustable to just about any grip size with the included silicon ring and adjustable tension gear. It is a universal product, which should work with most motorcycles having a twist throttle — whether Yamaha, Suzuki, Kawasaki, Honda, Harley-Davidson, etc. The Go Cruise 2 throttle control is CNC’d from 6061 Aluminum Alloy and has a textured, tactile feel to it. There is a protection strip, which contacts the brake lever in use, to keep the lever from being scratched. Setup can be done quick — under a minute or so. Once the desired speed is achieved, the throttle control lock is pressed against the brake lever. The bike will hold its speed. It will not readjust the speed automatically when going up inclines. The product provides a temporary mechanical cruise control. To turn off the lock, the throttle is twisted forward to disengage it. The Go Cruise 2 works well but does require me to push it forward to contact the brake lever while holding the throttle. A few times, I had to made minor adjustments to the tension gear, which was doable with gloves. Note: Anything that touches the throttle, front brake, or may take your eyes off the road could be dangerous — especially for inexperienced riders. The package has a big warning label. See below. All-in-all, the Go Cruise 2 is an inexpensive product that works and provides wrist relief on long rides. It did reduce fatigue in my hand when I used it on a trip because I wasn’t squeezing or gripping the throttle for 2 hours straight. Note: I only use it when I am riding the Interstate / freeway at 65-70 miles per hour. The trip is straight, long, and speeds rarely change. I will not use it in the city or curvy roads because it could be dangerous. 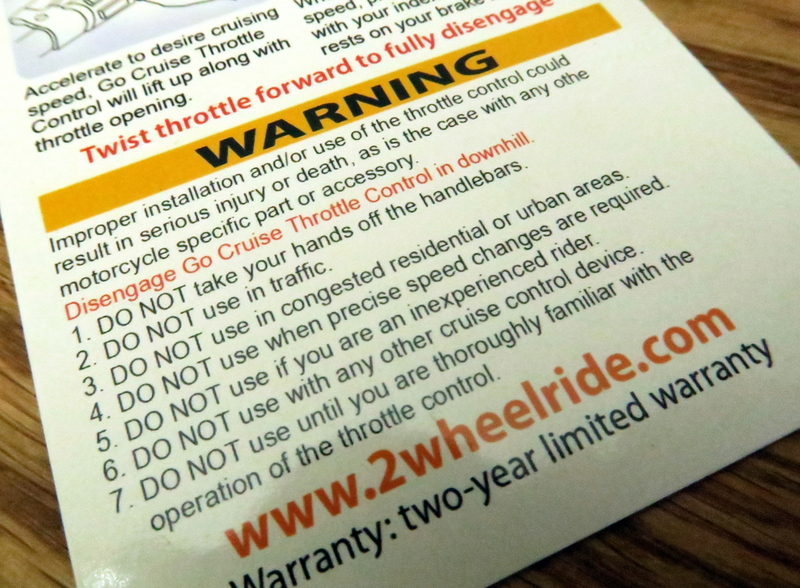 The Go Cruise 2 has a two-year limited warranty. The Crampbuster CB2 Wide is a throttle assist, not a throttle lock. Its design is pretty simple — just a paddle with a “C” opening to fit over the grip. There are no mechanical parts to break. However, I did read customer reviews of the plastic breaking. Mine has not broke, though. 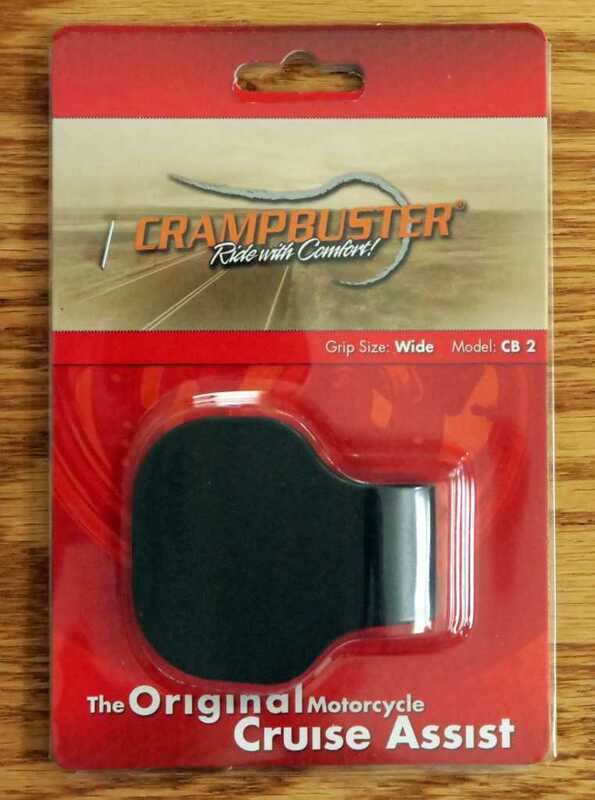 The Crampbuster fits grips up to 1-3/8 inches, and the over-sized version fits grips larger than 1-3/8 inches. From what I found: It is easy to goose the throttle more than expected when pushing my palm on it until I got a feel for it. The Crampbuster does take getting use to and is probably not a good idea for a new rider. Although the Crampbuster works on the the freeway for those long, straight hauls, it could be dangerous in the city or in the twisties. It is easy to take off and is what I do when I am not on the slab. For me, the best solution was to place the Crampbuster half on the grip and half on the bar weight. I can still maintain throttle control without touching the Crampbuster but can also rest my palm on it when necessary. No electronic cruise control — no problem for me! Although there are more good throttle assists and locks on the market, I only bought these two products. Both work well for their intended purpose. 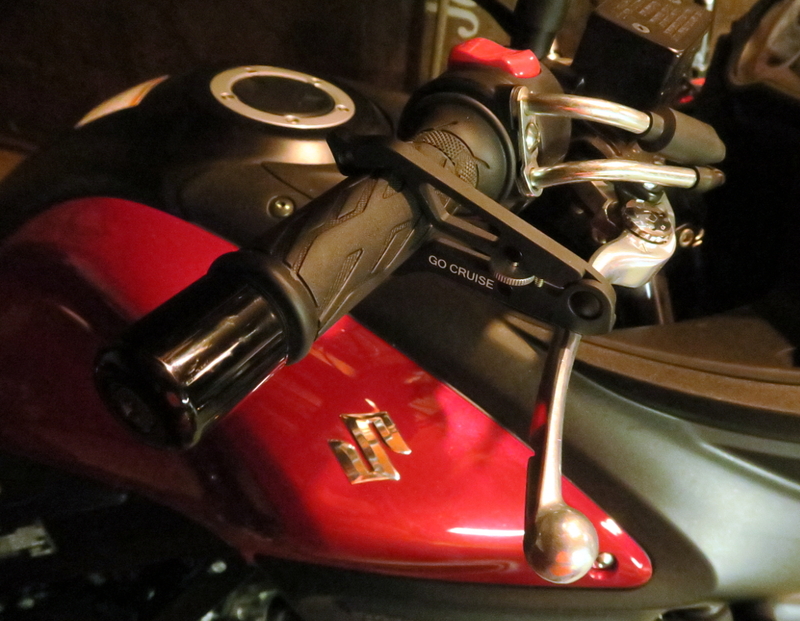 The Go Cruise 2 is easy to use and does provide a mechanical style cruise control on a motorcycle. It is made from aluminum, so I expect it will last. I think it looks kind of funky on the bike — sort of like an aluminum close pin. The Crampbuster is a throttle assist, which allows a more relaxed hand position on the bars. It allows the throttle to be controlled with your palm. The Crampbuster is easy to use and inexpensive. It is made of plastic, so it is difficult to say how long it will last — especially in colder weather. Neither product is for inexperienced riders. Maybe when I can afford a BMW R 1200 GS Adventure model, I can get electronic cruise control on a motorcycle. Until then, I will stick with the less expensive mechanical motorcycle throttle locks. Find good throttle locks for motorcycles in 2019 on Amazon.